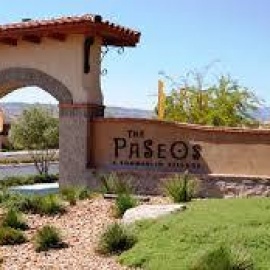 The Paseos is a village in Summerlin Las Vegas with over 350 acres of single family and multi-family neighborhoods located west of the I-215 beltway. The Paseos neighborhood home architecture was inspired by Hacienda and Mission styles of Spain with generous use of arches, courtyards and entry portals. 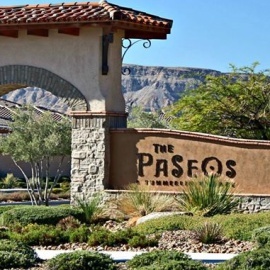 The Paseos is best known for its paseo trail system that runs from the southern to the northern border of the village and its large neighborhood park. The Paseos Park is a 12.5 acre community park which features a junior soccer / tee-ball field, sand volleyball court, a basketball court, tot lot, children’s play ground, picnic areas, interactive water feature, motorized toy area, and open turf areas.